India were grappling with injury worries on the eve of their first match against Sri Lanka in a cricket series which will serve as a litmus test for out-of-form Virender Sehwag in his bid to secure a World Cup berth. After their 3-1 victory over the West Indies, the Indians start as favourites against Sri Lanka in the last of their one-day series before they embark on the journey to capture the ICC World Cup. Concerned by the fallout of a long-drawn telecast dispute, the BCCI today appointed a four-member committee to amicably resolve the vexed issue of sharing the live feed of cricket matches between rights owner Nimbus and public broadcaster Prasar Bharati. There can be penalty of Rs 1 crore if private broadcasters do not share the live feeds of exclusive national sports events with Prasar Bharati going by the provisions of the Sports Broadcasting Signals (Mandatory Sharing with Prasar Bharti) Ordinance, 2007. M. P. Pandove, Honorary Joint Secretary, BCCI, has been appointed as Team India Manager for the World Cup. 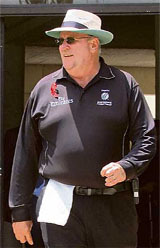 Australian umpire Darrell Hair said today he had filed a racial discrimination lawsuit against the Pakistan Cricket Board (PCB) and the International Cricket Council (ICC). Hair was sacked from the ICC’s elite panel of umpires after Pakistan complained about his role in a ball-tampering row in the forfeited Oval test against England last August. Mohammad Yousuf led a sensational display by Pakistan’s batsmen in the second one-day international against South Africa in Durban today. Surprised and concerned about Pakistan’s fitness woes in the ongoing tour of South Africa, Pakistan Cricket Board (PCB) Chairman Nasim Ashraf has ordered an inquiry into the matter to avoid a repeat of the situation during next month’s World Cup in the West Indies. Andrew Symonds is certain to be included in Australia’s 15-member World Cup squad after the ICC gave approval for the all-rounder to be replaced in case he fails to recover from his shoulder injury in time for the mega-event starting next month in the West Indies. Medium pacer Yo Mahesh took four for 17 to lead India colts to a comprehensive nine-wicket victory over New Zealand and open up a 1-0 series lead at Bert Sutcliffe Oval at Lincoln today. HMV College Jalandhar will clash with Khalsa College Jalandhar A and Government College Ludhiana A will take on BD Arya College A in the semifinals of the Western Union six-a-side Punjab hockey league at the Olympian Surjit Hockey Stadium tomorrow morning. The final will also be played tomorrow. Asserting their supremacy, Brazil’s Sao Paulo Football Club defeated Kerala XI 3-0 in the fourth match of the Super Soccer series at the Jawaharlal Nehru International stadium here today. As many as three players - Ajit Agarkar, Irfan Pathan and Yuvraj Singh - were rendered doubtful starters because of injury problems forcing the team management to defer naming the playing line-up for the day-night encounter at the Eden Gardens. Agarkar was down with flu while Pathan, desperate to regain his form to earn a place in the World Cup squad, had a sore shoulder and did not bowl during practice. Yuvraj, who has just recovered from a knee injury, had a stiff back. The list of casualties may force the Indian think tank to alter their plans for the game which was expected to be watched by a capacity crowd. Indian captain Rahul Dravid said the playing eleven would be decided tomorrow to give the injured players a little more time to regain fitness. “I would have loved to announce the 12 for the match, but we could not do it now and probably we will wait till tomorrow morning,” Dravid said. Dravid gave enough indications that the Indians would not tinker with the opening combination of Sourav Ganguly and Robin Uthappa, which means that comeback man Sehwag would bat in the middle order. Asked how Sehwag was shaping up for his return match, Dravid said, “he is working hard in different areas, the smile is back on his face. He is keen to perform well tomorrow.” “We are looking forward to a good performance in the four-match series, we have a good team, Sri Lanka also has a very good side. This is our last opportunity to fine-tune our game before the World Cup and we will be happy to put up a good performance,” Dravid said. Besides Sehwag, Pathan and paceman Munaf Patel, considered vital cogs in team composition, will also be under the scanner before the selectors choose the final 15 for the World Cup on February 12. India, who are coming from a 3-1 win over the West Indies in the recent home series, would like to maintain the winning momentum and the massive 6-1 victory over the islanders a year ago could serve as a psychological cushion for the team. From Kolkata to Rajkot, all eyes will chase Sehwag, who will play the two make-or-break games of his life this week. In the months gone by, he was stripped of vice-captaincy and later was axed from the squad. But knowing his match-winning prowess, the selectors want to give him one last chance before making up their mind. Munaf, who sat out for a considerable time during the South Africa tour after sustaining an ankle injury, would be closely watched as far as his fitness was concerned. Baroda cricketer Pathan, who has won many matches for India with his all-round abilities, would also like to raise the bar for himself and regain his skill of devastating swing bowling in order to stake claim for a ticket to the Caribbean. Strokeful opener Uthappa, who has already emerged as a formidable contender for a berth in cricket’s showpiece event, needs a couple of good knocks to cement his place and Eden Gardens could provide him the perfect stage for one of those. With the dew factor likely to play a crucial role, the cricket buffs would be keen to see whether India sticks to a double-spin attack in the form of offie Harbhajan Singh and leggie Anil Kumble or opts for more seamers. But it is real party time for the Kolkata crowd. Apart from getting the match out-of-the blue after the original hosts Pune developed last-minute hitches, the presence of in-form local boy Ganguly in the team has drawn enough interest among the denizens. Sri Lanka have a depleted side, as two of their key bowlers, off-spinner Muttiah Muralitharan and pacer Chaminda Vaas, could not make the trip due to injury. But such is the depth in the Lankan batting that it will compensate for the absence of the two experienced bowlers in the side. Young sensation Upul Tharanga, the experienced Sanath Jayasuriya, skipper Mahela Jayawardene, veteran Marvan Atapattu and vice-captain Kumar Sangakkara are likely to provide enough challenge to the Indian bowlers. A day after he was declared the batsman of the year for his sterling performance in domestic cricket, Bengal batsman Manoj Tiwary was called to do duty as 12th man for the Indian team in tomorrow’s one-dayer. Confirming the development, BCCI secretary Niranjan Shah told PTI that in view of a number of injuries in the Indian team, Tiwary has been asked to join the team and if required he will do the fielding for the team in tomorrow’s match. “It is great honour to join the Indian team, it is dream come true”, an excited Tiwary said immediately after learning about the good news. It will be proud moment for me to share the dressing room with the Indian team. I will now try harder to get into the playing eleven of the Indian team,” the 21-year old batsman said. Apart from the fact that Sri Lanka have chosen to rest their key bowlers Chaminda Vaas and Muthiah Muralitharan, the manner in which the Indian batting has come good augurs well not just for this series but also the World Cup. Back at the top of the order and hitting the ball sweetly is Sourav Ganguly, and in Robin Uthappa he has found an opening partner who looks pretty solid in defence and has an attacking streak to match Virender Sehwag’s. The Delhi player’s return to the team gives Dravid plenty of flexibility, especially now that both he and Tendulkar are back to their best. It means that either of them can float up and down the order depending on the start that the openers have given. There is also Mahendra Singh Dhoni, who can be promoted up the order and though Pathan hasn’t quite got back his bowling rhythm, his batting will be useful if things get sticky against the canny Lankans. The only question-mark is against Yuvraj, and that is not about his ability but how quickly he can get back to hitting the ball as only he can. It is never easy to recapture one’s touch after a long layoff, especially if it has been forced upon him by a serious injury. Yuvraj’s innate self-confidence should get him back among the runs sooner than later. That will complete the batting picture for the Indian team. The bowling looks in good hands with Zaheer and Agarkar, but they will have a real workout against the Sri Lankans, who come to India this time in a better frame than the last time they were here about 15 months ago. Sanath Jayasuriya has belted some big ones in New Zealand and Sangakkara has been the lynchpin of the batting against the Kiwis when the ball was doing something. Their captain Jayawardene was not at his fluent best in New Zealand, but he is too classy a player to miss out for long, and with Atapattu back in the team, there is lots of class and experience in the Lankan batting. So it should be a good test for the Indian bowlers. The ones who will be under pressure are Pathan and Harbhajan. The Lankans will try and attack them, knowing that they are still not certainties for the World Cup squad. Kumble will have to bring all his experience into play against the Sri Lankan batting, and if the pitches are good, then the spectators could be in for a treat with the batting from both teams. Lasith Malinga who bowls with a slinging action will be the bowler who the Indians will have to watch out for. He is the ‘X’ factor, as the intelligent Sangakkara has pointed out, and that’s what has given Sri Lanka the additional firepower to bowl sides out. The decision to form the committee, which would interact with the government and Nimbus, was taken at the BCCI’s working committee meeting, which deliberated at length on the telecast row. Board’s vice-president Shashank Manohar will head the panel while vice-president Lalit Modi, treasurer N. Srinivasan and Punjab Cricket Association president I.S. Bindra will be the other members. The dispute between Nimbus, which bought the telecast rights for a whopping $612 million, and Prasar Bharati had deprived thousands of cricket fans of watching the first India-West Indies cricket one-dayer live. As both the parties moved court, the government came out with an Ordinance making it mandatory for the right owners to share the live feed with Prasar Bharati. “The issue was deliberated upon and a four-member panel has been constituted. It will look at the pros and cons of the Ordinance and talk to the government and hopefully the issue will be resolved,” BCCI vice-president and media committee convenor Rajiv Shukla told reporters here. “The board thinks that people should not be deprived and the rights holders should not be affected. 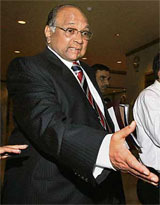 The BCCI understands its responsibility towards both the sides and it is better that a middle path is found,” he said. The BCCI has already started discussions with the government on the issue. “Yesterday board president Sharad Pawar met Information and Broadcasting Minister Priya Ranjan Dasmunsi and hopefully the committee will devise a formula,” he said. Asked whether the BCCI would suffer financial losses if an amicable solution was worked out, board secretary Niranjan Shah said such a scenario would not arise. “There is nothing about suffering losses. Only a few technical things are there (to be sorted out),” he said. The working committee also discussed the proposed performance-linked contract for the players and it was decided to implement the scheme before the World Cup. “Before the World Cup it will be ready. We will call some senior players for a meeting and it will be resolved,” he said. On whether some internal problems in the board were proving to be hurdles for renewal of contracts, Shah said it was getting delayed because of the packed schedule. “There were so many tournaments and the schedule is so busy. We are looking at some modalities. We will put it before the players soon,” he said, adding the delay would not affect the cricketers as the contracts would be applicable with retrospective effect—from October, 2006. The board also decided to appoint Sanjay Jagdale, a current selector, and joint secretary M.P. Pandove as managers of the Indian team for the World Cup in the West Indies. “Jagdale and Pandove will be the two managers for the team during the World Cup. Since Pandove is a government servant, he had to seek some permissions and because of this he will join the side after 15 days,” he said. On the board’s attempt to launch the ‘BCCI Brand’, on which a two-day conference is currently on here, Shah said some 4-5 overseas companies would make presentations after which a decision would be taken. “A two-day meeting is going on (in this regard). Some 4-5 overseas parties have come and they will make their presentations. We will see what kind of suggestions are coming and try to exploit the brand,” he said. Shah said the BCCI would send Robin Singh as the coach of the Cuban team. “Cuban team had asked for a coach and Robin Singh is to be sent there,” he said. The controversy over Indian cricket team manager Chetan Desai’s critical report on the South African tour took a new turn today with the BCCI claiming that it had not received any such report yet. A day after a TV channel’s sensational disclosure that coach Greg Chappell and Virender Sehwag were engaged in a feud during the Durban Test, the cricket board continued to maintain silence on the authenticity of Desai’s report. “The BCCI president said he has not received such a report. Without knowing what is there in the report and its authenticity, we cannot comment on what a TV channel is showing,” BCCI vice-president Rajiv Shukla told reporters here. Shukla also declined to comment on captain Rahul Dravid’s outburst in Kolkata dismissing Desai as someone who has no standing in the game. “I don’t think it would be appropriate to comment on this,” he said. Team managers are normally required to submit their tour reports to the BCCI within two weeks after completion of the assignment. India’s tour of South Africa ended in the first week of January and Desai, who is also the secretary of the Goa Cricket Association, said he had already submitted his report. The report was said to be critical of Sehwag’s attitude to the game and also did not spare Dravid for being stubborn in selection matters, specially in the crucial third Test in Cape Town where an unfit Munaf Patel was chosen. Meanwhile, skipper Rahul Dravid today dismissed Chetan Desai as someone without a “standing” in the game. An angry Dravid refused to comment on the tour report of Desai which is reportedly critical of Virender Sehwag’s attitude towards the game. The Ordinance notified on Saturday empowers the government to suspend or revoke the private broadcaster’s licence for operating in this country. The Ordinance takes effect retrospectively from November 11, 2005. The Ordinance also stipulates that no order of the government, including the guidelines for downlinking and uplinking of channels would be challenged in a court of law. The Ordinance provides for a revenue sharing formula between private and public broadcasters. Advertisement sharing between private and public broadcasters would be in the ratio of 75:25 in respect of TV coverage and 50:50 in the case of radio coverage. The decision was taken in the BCCI’s Working Committee meeting, held under the chairmanship of Board’s President Sharad Pawar at New Delhi today. Earlier, Mr Pandove did not want to take the responsibility of officiating as manager of the Indian team due to some personal reasons. But seeing his dedication and integrity, the committee members forced him to take over the responsibility. “Yes it was right that due to some personal reasons I was reluctant to take the responsibility. But now I will join the team after March 10,” Mr Pandove told TNS on the phone from New Delhi. “This is a big responsibility and I will ensure that the team remains in high spirits. To see that they are comfortable as well as they follow the BCCI code of conduct during the tour will be my main priorities,” added Mr Pandove, who is also Honorary Secretary of the Punjab Cricket Association. Australian umpire Darrell Hair said today he had filed a racial discrimination lawsuit against the Pakistan Cricket Board (PCB) and the International Cricket Council (ICC). Hair was sacked from the ICC’s elite panel of umpires after Pakistan complained about his role in a ball-tampering row in the forfeited Oval test against England last August. “I can confirm that I have instructed my lawyers...to issue an application in the London Central Employment Tribunal alleging racial discrimination by the ICC and PCB,” he told a news conference in Nairobi. “I have had no response yet from the ICC,” Hair said. The PCB said it rejected the allegations made against the board. “We have given a stiff response to Hair’s notice as our stand is clear—the International Cricket Council took action against him and not the PCB,” Saleem Altaf, the PCB’s director of cricket operations told Reuters. “Our lawyer has sent back a strong response to the notice and we don’t accept his stand. He was penalised by the ICC members and not just Pakistan,” he added. Pakistan refused to continue the match after Hair and fellow umpire Billy Doctrove changed the ball and charged the Pakistanis with ball tampering on the fourth day of the Oval test. Hair and West Indian Doctrove eventually awarded the match to England and the ICC charged Pakistan captain Inzamam-ul-Haq with bringing the game into disrepute. In September, the ICC cleared Inzamam and his team of ball tampering but banned the captain for four one-day games on the disrepute charge. Doctrove is back supervising international matches while the ICC appointed Hair to stand in an ICC qualifying tournament in Nairobi. He was supervising a game between Kenya and Scotland today. “It is a shame that this has to overshadow everything after a good tournament like this. I don’t know what impact it will have on my career as an umpire,” Hair said. Yousuf top-scored with 101 not out as Pakistan totalled a record 351 for four after winning the toss and choosing to bat. Pakistan’s previous highest total against South Africa was the 335 for six they scored in Port Elizabeth in 2002-03. The total was Pakistan’s third highest against any opposition. Other weighty innings came from Younis Khan, who scored 93, Shahid Afridi, who was 77 not out, and Imran Nazir, who made 57. Yousuf faced 111 balls and hit 12 fours in a relatively measured innings that contrasted sharply with the frenetic batting of some of his team mates. The free-scoring Afridi reached his half-century off 20 balls, while Nazir, who played his first one-day international since July 2004, passed 50 in 32 balls. In all, Afridi faced 35 balls and hit five fours and six sixes. The South Africans bowled too short on a pitch that offered bounce but less pace than expected and the Pakistanis took full toll by smashing 35 fours and 11 sixes in their innings. South Africa started well when Kamran Akmal offered no stroke to a delivery from medium pacer Shaun Pollock and was trapped in front for nought with just the fourth ball of the match. Nazir and Khan soon put Pakistan on the front foot with a partnership of 79 off 66 balls. The stand was ended in the 12th over when fast bowler Charl Langeveldt dismissed a swinging Nazir leg-before. “The PCB chief is surprised the way players got unfit and he wants to know the reasons why they (players) suffered major injury problems. We believe an inquiry into the matter will serve the purpose,” PCB Director of Operations Saleem Altaf told reporters here. “We will soon be launching an inquiry into this matter to know why and how these injuries and fitness problems took place,” he added. Pakistan have so far lost pacers Shoaib Akhtar, Umar Gul, Shabbir Ahmed and all-rounder Shoaib Malik to injuries and fitness problems and Rao Iftikhar Anjum will be sent to South Africa to cop with the bowling crisis after Inzamam-ul Haq’s men lost the opening one-dayer against the hosts by a massive 164 runs at Centurion. The PCB official said Dr Ashraf does not want a repeat of the situation in the upcoming World Cup. Mahesh dismissed three key Kiwi batsmen as the hosts were skittled out for a paltry 103 in 39.5 overs. Captain Andrew de Boorder top-scored with 29 in the Kiwi innings. In reply, Ravi Teja hit six fours and two sixes in his unbeaten 52 as India raced to victory in just 13.5 overs. In the quarterfinals today, HMV College edged out Sports Wing, Kairon 5-0. Vandana scored four goals including a hat-trick and Amandeep Kaur scored one. Khalsa College beat BD Arya College B 4-3 via a tie breaker. Both teams were locked at 2-2 at the end of stipulated time. For BD Arya B, both goals were scored by Ritu Bala. For Khalsa College, the scorers were Monika and Rajni. In the third quarterfinals’ match, Government College beat BBK DAV Amritsar 4-3. For the winners, Parjeet scored two goals while Manjot and Mamta scored one each. Meena, Sania Sharma and Kulbir sounded the board for the losers. BD Arya College A beat Khalsa College Ludhiana A 4-2. For the winners, the scorers were Simranjit, Parminder, Kirandeep and Ramandeep while Samita and Mini struck once each for the losers. The Kerala XI, virtually the state Santosh trophy team, found it tough to contain the visitors.